This large dabbling duck is similar in appearance to hen mallards and has been known to hybridize with them. The mottled duck can be distinguished from mallards by examining the borders on the bluish-green speculum. On mottled ducks the leading edge is black, while the trailing edge is white. Mottled ducks have an average length of 21 inches and an average weight of 2 1/4 pounds. 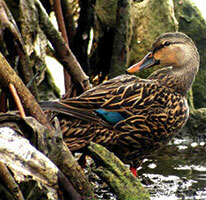 Mottled ducks are found mainly on the gulf coast of Mexico and the United States, and parts of the Florida Panhandle. Mottled ducks were introduced into South Carolina in the late 1970s and can be found in isolated populations along the South Carolina coast. Mottled ducks are the only duck adapted to breeding in southern marshes. They commonly use fresh emergent and brackish wetlands, as well as managed impoundments. During the breeding season the bulk of the female's diet is made up of aquatic invertebrates. During the fall and winter months seeds of grasses, aquatic vegetation, rice, and small fish are added to the diet. Mottled ducks are one of the earliest ducks to form pair bonds, often starting as early as August. The female constructs the nest which consists of a bowl-shaped depression in grass, lined with down and shredded grass. The hen lays 5-13 dull white to olive colored eggs. Drakes voice is a low raspy raeb , and hens have a loud, raspy quack. Similar to mallards.